This grave has a carved anchor, used by early Christians as a disguised cross, and as a marker to guide the way to secret meeting places. A Christian symbol of hope, it is found as funerary symbolism in the art of the catacombs. Michael William (or Michael William) Underhill (born in Oxford on 29 November 1830, recorded in register of New Road Baptist Chapel). Charles’s parents are recorded in the New Road Baptist Chapel register as living in St Aldate’s parish from 1813 to 1818, and then variously in St Martin’s/All Saints’ parish from the time of Charles’s birth in 1820. Michael Underhill’s shop was at 138 High Street in All Saints’ parish in 1839, and he already then had another branch in St Clement’s Street. By 1841 the central Oxford shop was at 7 High Street, also in All Saints’ parish: it survived until the early 1920s, when it was taken over by the International Stores. At the time of the 1841 census Charles was a young grocer of 21, living over the family shop at 7 High Street with his parents; his sisters Ann, Mary, Charlotte, and Matilda; and his younger brother Henry. An apprentice grocer also lived with the family, and they had one servant. In the fourth quarter of 1841 at Witney, Charles Underhill married his first wife Mary Tozer (born in Taunton in c.1816). For more on Mary’s background, see her separate grave. Emily Rosa Underhill (born in 1856, reg. third quarter). Between 1849 and 1855 three children died soon after birth: these were buried in a separate grave in St Sepulchre’s Cemetery. By the time of the 1851 census, when Charles Underhill was 31, he described himself as a “Master Grocer/Tea Dealer”, and had set up in business on his own at 11 Beaumont Street in St Mary Magdalen parish, and he and his wife Mary lived over the shop with their six young children Charles (9), Harriet (8), Frederick (7), Ernest (5), Mary (4), William (four months), plus a grocer’s assistant and three servants. 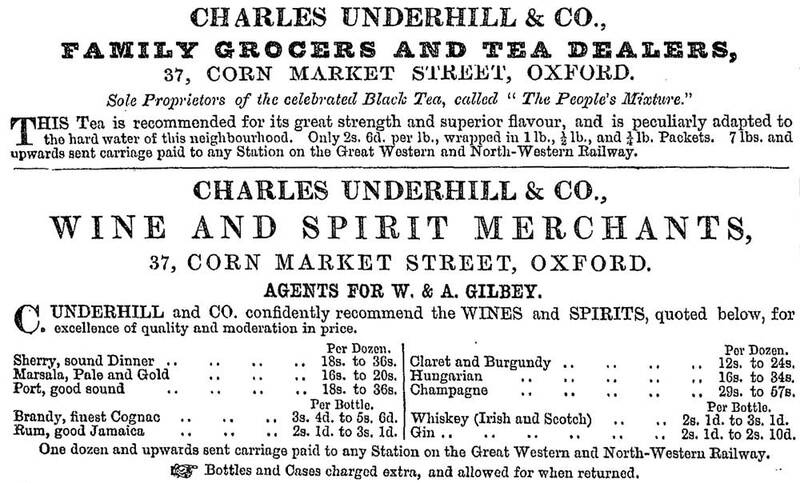 In Jackson’s Oxford Journal of 1 April 1854 Thomas Tubb, the grocer at 37 Cornmarket Street (on the north corner of the junction with St Michael Street, right), inserted a notice to say he had relinquished his business to Charles Underhill; and Underhill added a notice saying that once alterations to the Cornmarket premises were complete, his house of business in Beaumont Street would be closed. Charles Underhill’s grocer’s business was to remain at these premises in St Michael’s parish from 1854 to the mid-1920s. From 1862 he is listed as having a licence to sell wine from this shop, and from 1866 at his new branch in St Clement’s). When Charles Underhill took over this new shop in 1854, he and his family did not move in upstairs, but went to live in a private house, Diamond Villa in South Parade, Summertown. Charles Underhill’s first wife, Mary, died at Summertown at the age of 40 in early 1858 and was buried with her infant children in St Sepulchre’s Cemetery: see separate grave. 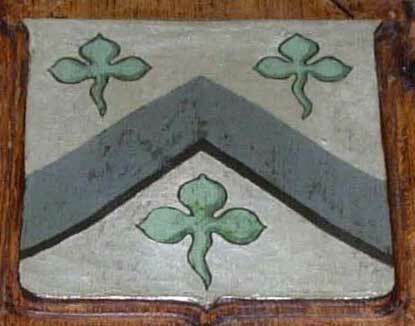 Their son William Stephen Underhill died at the age of seven later that year, and appears to have been buried with her. George Francis Underhill (born in Oxford in 1863/4, and baptised at St Peter-le-Bailey Church at the age of 20 on 14 February 1883, just two years before his death). At the time of the 1861 census Charles Underhill (41) was living at Diamond Villa with his second wife Ellen (37) and their son Sydney (1). Also living with them were four children from his first marriage – Frederick (16), Ernest (14), Ellen (13), and Emily (5) – as well as his first wife’s sister Miss Selena Tozer. They had three servants. 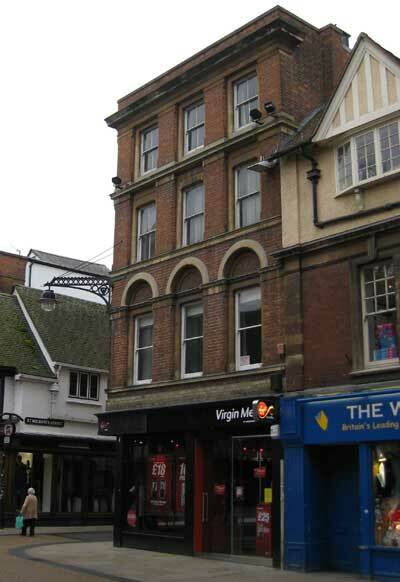 In 1861 Charles’s son Charles Maitland Underhill (18), described as a grocer’s assistant, was living over his father’s Cornmarket shop with his sister Harriett Roffey Underhill (17) and a housekeeper, and he eventually took over the shop. On 6 May 1865 at the George Street Chapel in Oxford, Charles l's daughter Harriett Roffey Underhill married Robert Anderson, Esq. of Hawk's Law House, levon, Fife. They had one daughter, Mary Maitland Anderson, but Harriett died in Dundee at the age of 23 just two years after her wedding on 5 June 1867. Underhill was first elected to the City Council as a Conservative for the Central ward in November 1866. On 9 March 1868 Charles’s father Michael Underhill died at the age of 81 at his residence, 21 St John Street. His effects came to nearly £9,000. The 1871 census shows Underhill (described as a grocer & wine merchant employing four men) living here with his wife and his three youngest children: Emily Rosa (14), Sydney Francis (11), and George Francis (7), with two servants. His son Frederick (26), who was described as a grocer, and his daughter Mary (23) were living separately with one servant at 27 Walton Crescent. His two other surviving children, Charles Maitland and Ernest Augustus, were both married and in charge of the two family shops, living upstairs: the former was at Cornmarket, and the latter at St Clement’s branch. Both also held wine licences for their shops. In 1872 Charles Underhill took out a lease on 16 Bradmore Road, but he did not live there, and appears to have let it out to the former mayor James Stanley Lowe. “The Scripture doctrine of regeneration” (1878). 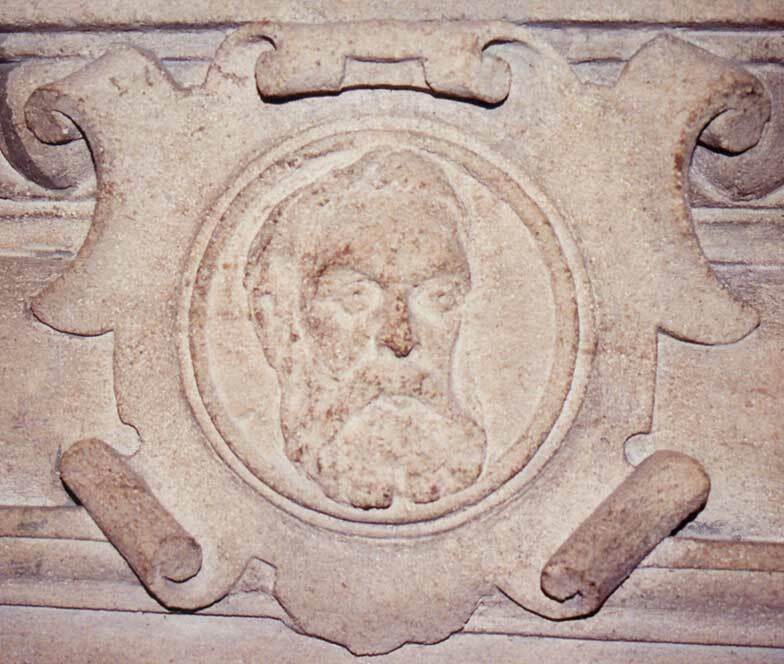 He also gave lectures at the Town Hall on Sunday afternoons on “The Immortality of the Soul” (11 October 1874) and “The Nature of the Future Punishment of the Wicked” (18 October 1874). Mr C. Underhill, grocer, after giving some information about the St Giles’s district, said he had been nine years in the Town Council, but was not placed on any committees of importance, he being a Conservative, and the majority of the Town Council Liberals. It cost about £20 to contest the Central ward, and £60 or £70 to contest the North ward, in which there were more voters…. The 1881 census shows Underhill at the age of 61 (described as a grocer and Justice of the Peace) living at 57 Banbury Road with his wife Ellen, his daughters Mary (33) and Emily (24), and his two youngest sons: Sydney (20) was also a grocer, and George Francis (17) was an architect. Charles Underhill was re-elected as a councillor for the Central Ward in November 1881, and he led the Conservative Party on the council from 1882. † George Francis Underhill died at 57 Banbury Road at the age of 21 on 24 November 1885 and was buried at St Sepulchre’s Cemetery on 30 November (burial recorded in the parish registers of both of St Philip & James and St Giles Church). 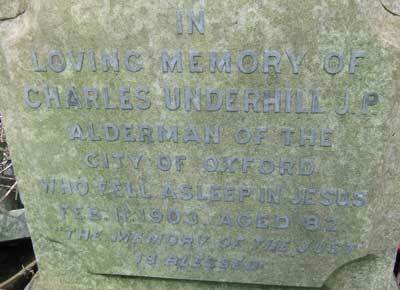 In July 1887 Charles Underhill was made an Alderman and elected Mayor of Oxford (for 1887/8). 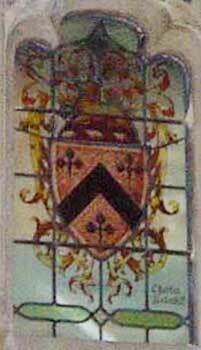 His arms (left) can be seen in a window of the Council Chamber and (right) on the wall of the Lord Mayor’s Parlour. In 1889 Oxford was made a County Borough and the Central Ward was abolished. Underhill was then elected a Councillor for the West Ward, and was re-elected twice to this position before being made an Alderman again in March 1896, a vacancy having occurred following the death of his brother, Alderman Henry S. Underhill. At the time of the 1891 census Underhill’s two spinster daughters, Mary Ellen (44) and Emily Rosa (35), were living with him and his wife. Emily was still with them in 1901. Charles Underhill (81) was still a magistrate in 1901, but in November 1902 he retired from all council committees because of his ill-health: at that time he was on the Assessment, Parliamentary, Property & Estates, Waterworks, and Visitors to Littlemore Asylum Committees. 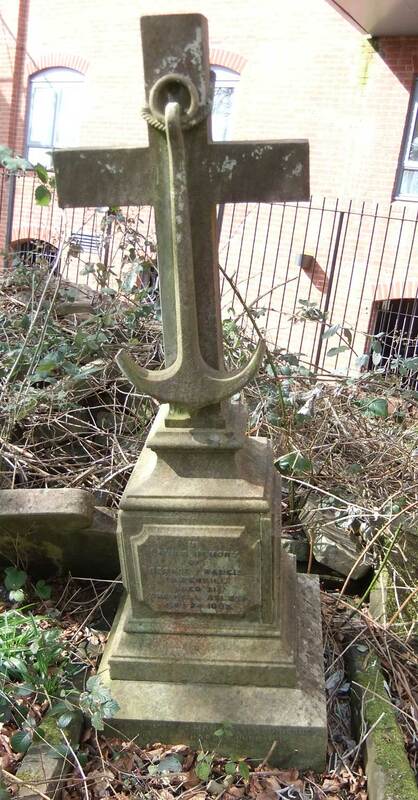 † Charles Underhill died at 57 Banbury Road the age of 82 on 11 February 1903. He was buried at St Sepulchre’s Cemetery on 16 February, with the Rector of St Peter-le-Bailey Church conducting the funeral at the chapel there (burial recorded in the parish registers of both of St Philip & James and St Giles Church). His effects came to £9,658, and his four surviving sons (Charles, Frederick, Ernest, and Sydney), who were all grocers, were his executors. † Mrs Ellen Underhill, née Francis died at 57 Banbury Road at the age of 80 on 18 August 1904 and was buried at St Sepulchre’s Cemetery on 23 August (burial recorded in the parish registers of both of St Philip & James and St Giles Church, with “Nonconformist” added in the former entry, and “Church burial service not used” in the latter). Miss Emily Rosa Underhill moved out of 57 Banbury Road after her stepmother’s death, and at the time of the 1911 census was living alone at 51 Stratfield Road, Summertown with a servant. It appears that her sister Miss Mary Ellen Underhill came to live with her, as she died at this address at the age of 80 on 11 June 1928. As her burial is recorded in the parish register of St Giles’s Church rather than that of Summertown, it is likely that she too was buried in St Sepulchre’s Cemetery. Her personal effects came to £252, and probate was granted to her sister Emily. Emily was still apparently living at Stratfield Road in 1941, but she died that year in Abingdon. † Miss Emily Rosa Underhill died at Barton Court, Abingdon at the age of 84 on 9 March 1941 and was buried at St Sepulchre’s Cemetery on 13 March (burial recorded in the parish register of St Giles’s Church, with the cemetery specifically named). Her effects came to £5,026. FUNERAL OF THE LATER ALDERMAN UNDERHILL. The wreaths etc., were both numerous and beautiful, and included an extremely choice floral anchor from the widow, and others from the family, Mr. and Mrs. G. Herbert Morrell, the grandchildren in St. Clement’s and St. Margaret’s Road, Mrs. H. S. Underhill, Mrs. Edward B. Underhill (Hampstead), the Town Clerk, Mrs Fanny Bettinson, Hitchin, Ida, Lallie, Nell, Edith, Frank, Kenneth, Katie, Tom, Grace, Dora, Tessie, and Emily, the Chairman and Directors of the Randolph Hotel, Mr. and Mrs. Edward Beaumont, Nurse Lilla Cook, Mr. and Mrs. Lillington, Mrs. Hills and family (Willesden Green), Mr. and Mrs. W. J. Freeborn, Mr. and Mrs. Edgar Mills, AND Nellie, Mr. and Mrs. Alfred Boffin and Lucy, the servants (Agnes, Lizzie AND Durham, the Freemen’s Committee, and Messrs. H. Hine. H. Taylor, C. H. Markham, H. Skinner, H. Hornsey, R. G. Webb, N. Robinson, T. V. Brown, and W. Lord. The funeral arrangements were carried out by the City Drapery Stores, High-street. Charles Maitland Underhill (born 1842) took over his father’s grocery business at 37 Cornmarket Street. On 30 August 1870 he married Louisa Mary Blake of 8 Oriel Street, the daughter of a college servant at Corpus Christi College, at St Mary the Virgin Church. His wife gave birth to twins, Constance and Arthur Underhill, over this shop on 22 September 1871, and their son Charles Bernard Underhill on 23 July 1873. In 1881 he and his wife were living at 14 Warnborough Road with their three children and a servant. In 1891 they were living alone at 1 Warnborough Road with one servant. 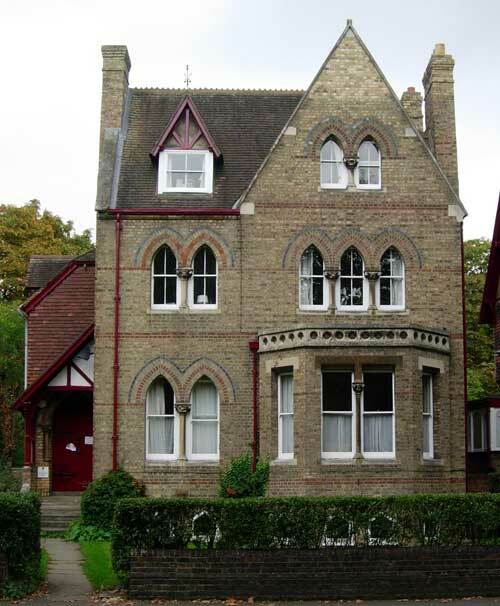 By 1901 they were living at St Margaret’s Road with Constance (29) and Charles Bernard (27), who was described as a mathematical instructor: Charles Bernard Underhill died the following year in the Thame district at the age of 29. Charles and his wife were on their own again at that address in 1911, and Charles (68) was still described as a grocer and wine merchant. He died at 6 Stratfield Road, Summertown at the age of 81 on 20 January 1924, and his effects came to just over £5,097. With no son to succeed him, the shop at 37 Cornmarket Street closed. Harriet Roffey Underhill (born 1842/3) married Robert Anderson in Oxford in the second quarter of 1865. They went to live in Scotland, where their daughter Mary Maitland Anderson was born. Frederick Robert Underhill (born 1844) initially managed the family’s grocer’s shop at 37 Cornmarket with his brother Charles. He married Mary Hills, the daughter of the photographer Robert Hills, at Cambridge on 20 April 1871, and their first child Mary was born in Oxford in 1871/2. They moved to Norwich soon after her birth, where they had three more children: Douglas (1873), Edith (1874), and Robert (1877/8). At the time of the 1881 census he and his family were living with two servants at 1 Carlton Terrace, Heigham, Norwich, and he was described as a grocer employing six men and a boy. By 1891 they had moved to Surrey Road, Norwich, and Douglas was now a music student. Frederick died in Norwich at the age of 64 in 1909. Ernest Augustus Underhill (born 1846) took over his father’s grocery business in St Clement’s. He married Catharine Mary French in Buckingham in the third quarter of 1868, and they had nine children: Helen Mabel Underhill (1869), Reginald Stanley Underhill (1870), Stella Jessie Underhill (1872), Harriet Ethelwynne Underhill (1874), Hildah Catherine (1876), Muriel Marion Underhill (1878), Norah Christine Underhill (1880), Frances Olive Underhill (1883), and Leo Kingsley Underhill (1888). At the time of the 1881 census he was described as a grocer & wine merchant employing four men and four boys, and he and his wife were living at 15 St Clement’s Street with their six children and two servants. He died at the Little House, Highfield, Headington at the age of 67 on 11 March 1914. He was buried in Headington Cemetery, and Catherine was buried with him in 1931. Sydney Francis Underhill (born 1860) also became a grocer and served as Mayor of Oxford: more information here. He died in 1934.